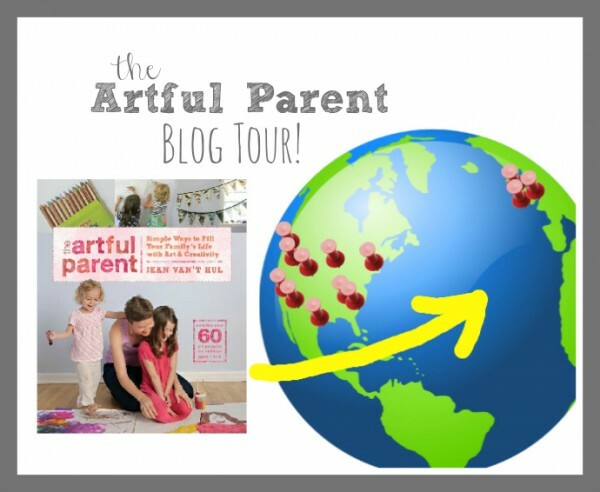 As a longtime fan of Jean Van’t Hul’s charming, approachable, and ever-inspiring blog, The Artful Parent, I’m thrilled about the upcoming release of her book, The Artful Parent: Simple Ways to Fill Your Family’s Life with Art & Creativity. Not only has Jean been a huge source of inspiration to me and countless others, but we’ve become real-life friends and I have a great deal of respect for the way that she encourages her children to find their inner voice through hands-on learning. And her delightful book does not disappoint. The book comes out on April 9, 2013, so consider this a sneak peek…and read through to the end for details on how you could win your very own copy. My two-year old and I spent the morning together and I came to the realization that she rarely gets the opportunity to dive into so many of the projects that her older sister enjoyed. Now that I have two children, my girls and I are frequently on the go, my attention is often divided, and their abilities are so different that I usually follow my older child’s interests while her younger sister tags along…and does a great job at keeping up. 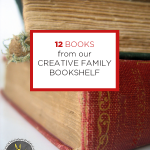 Since Jean’s blog was there for me when my first toddler and I got our creative groove on, I thought we’d see what ideas she had in store for us. When I flipped the book to the very first project, Contact Paper Suncatchers, I knew this was for us. My older daughter and I one made these contact paper suncatchers and this contact paper collage, and we still had plenty of leftover materials to play with. By some miracle I woke up early and set out all of the materials before my daughter woke up. To set this up as we did, tape a piece of contact paper to your table. This will keep the contact paper from moving around. 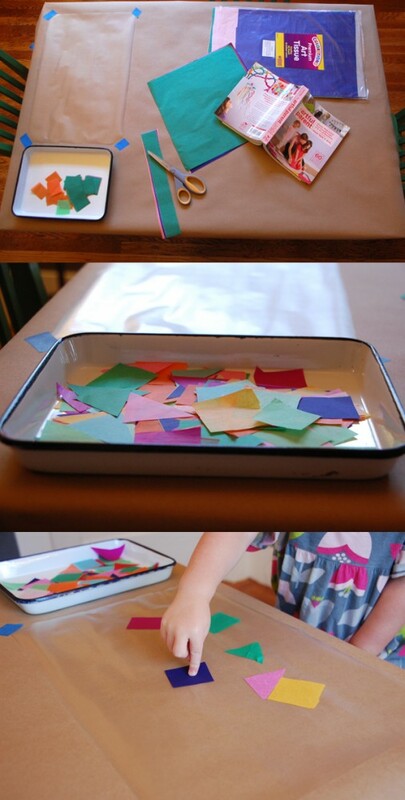 Fill a bowl or tray with pre-cut pieces of colorful tissue paper, and then invite your child to attach the pieces to the contact paper. My daughter’s first instinct was to glue the pieces down, but once she understood how the contact paper worked, she put the glue aside. At some point she decided to layer her collage and realized that she did, in fact, need the glue to stick these extra papers on. If your child takes the project in a new direction as mine did, do your best to go with the flow. Oh, one more thing…I was also quite honored that Jean invited me to write a piece for her book — what a delight to see this fun provocation in print! 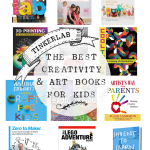 The Artful Parent is not only jam-packed with sixty simple and creative projects, but it’s also full of tips on the best art supplies for your art pantry, how to talk with children about art, and how to set up an art space. If you’d like a copy of the book, if you pre-order now you’ll get almost 40% off the cover price. On top of that, if the Amazon price decreases between your order time and the end of the day of the release date, you’ll receive the lowest price. To enter for a chance to win a copy of Jean’s book (if you buy the book for yourself, your winning book would be a great gift! ), leave a comment at the end of this post. Contest Details: You must have a U.S. address to win. Deadline for entries is Friday, April 22, 2013, 9 pm PST. Winner will be chosen randomly. Thank you to everyone who submitted a comment! I loved reading all of your inspiring memories and stories. Congratulations to Megan, comment #26! You will be contacted via email regarding your prize. Thinking back to your childhood, what is the earliest piece of art that you remember making? The one piece of artwork from my childhood that sticks out in my mind is this paper mache doll I made in grade school for an art contest. I remember working super hard on it and was so proud of it. what a fantastic looking book! 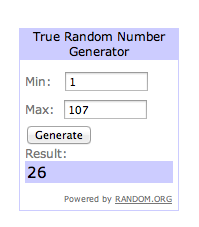 thanks for the opportunity to win a copy! i remember drawing a sun on an aluminum pie plate with indelible markers. it made real impression on me – drawing on something other than paper, the look of the marker on a silver background…. Lovely! Adore this blog and Jean’s approach to art with young children. Would love to win a copy of this book! I remember cross stitching my initials with my mom when I was 5. We then turned it into a throw pillow for my bed. I still have it! I remember making painted t-shirts, an eggshell covered jewelry box, a painted plate, so many. I had a brilliant time in art class when I was little! I have the winter and spring ebook. They have saved us from boredom on so many occasions! It is my go to guide for things to do! I remember chocolate pudding finger painting in Kindergarten. We each got a bowl of chocolate pudding to plop onto our finger paint paper, and then we went to town. Of course, the best part was licking our fingers at the end. Excited for Jean’s book as well. We always had drawing materials around but the first thing I really remember was making fabric and lace Easter eggs at my grandma’s house. My mom still hangs them from a branch in a vase every spring. I remember making a paper-mache suncatcher. It seems paper mache is quite memorable for people! In preschool, I remember making a handprint plaque for my dad. I can still feel the thick, oozy plaster of the mold around my hand. Later, we mounted an image from a greeting card onto a wooden plaque for christmas, and I chose a picture of three little mice singing carols, because my mom loved the cartoony Christmas mice. She brought that plaque out at Christmas every year since! Now, I do all kinds of creative projects with my little 3 yr. old. We would cherish this book! A drawing of my family is my earliest “art” that I can recall. A diorama of the circus, complete with a man on the trapeze made from a toothpick and string. It was amazing! 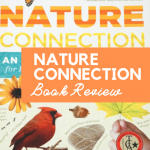 I am excited about this book – I love her blog, too! I have been following Jean for years; ever since her blog was brand-spanking new! 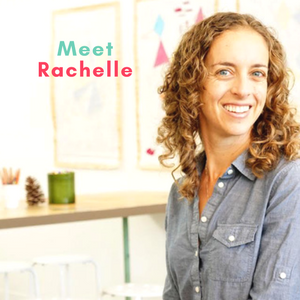 I LOVE her blog and I feel like her book will be just as awesome! Thanks for the chance to win! Fun craft idea for a gray day. Would love to win this book! I remember making a certificate for my parents for their anniversary. Would love to win this book. The tissue paper idea is brilliant. I’m sure I made lots of art projects when I was in pre-school and kindergarten, but I remember making large orange pom poms in first grade and decorated them as jack o lanterns for Halloween. Will try out the craft! Have a load of contact paper! I remember art being part of life as far back as my earliest memories – my Mom used to be an art teacher! I used to spend hours and hours painting at the easel my Dad made me, thinking I was Jackson Pollock! Collages! I remember making lots and lots of collages as a small child. And I can completely relate to have to consciously focus on activities for my youngest too. Sometimes I forget that there are things she just hasn’t gotten to do very often and even if they are old news to the older two, she still needs time to explore them. Great idea! Must get this ready for my daughter! I remember going to a craft day at our local library. I had a small square of cross-stitch fabric, and there were lots of buttons, and ribbon scraps, and colorful threads to sew with. I remember loving that activity so much. My Grandma loved to cook and taught me to cook so my introduction to art was through food. I remember making and decorating cut out cookies. What a great looking book! Earliest, playdough creations. My mother has such a imaginative soul. My younger sister and I spent countless hours during our childhood creating things from scratch including cards, paperdolls, and illustrated storybooks. I don’t remember the first but I think she has kept them all and some items even appear on her Christmas tree each year. I hope I can pass some of these experiences of being in the flow to my son. I am so delighted to find your website. I am also eagerly awaiting the new art book! Thank you so much for a chance to win! I have a two (almost three year old) and a 15 month old. We love doing art projects but I’m sometimes at a loss for what they can both do, soon I know they will both be on the same page..kinda 🙂 love this contact paper idea and would love to get this book!! I’ve already pre-ordered a copy, but if I win this one, I’ll gift to one of my sisters for their kids! The first art activity I can remember off-hand is making yarn mandalas at Vacation Bible School. My sisters and friends and I colored in coloring books a lot, too. 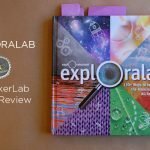 I’m so thankful to have tons of easy, creative ideas for my kids that don’t involve coloring books, thanks largely to Jean’s blog and e-books! Colored construction paper with contact paper over tin cans for pencil holders. Pre-School. Great blog! Thanks! I remember making LOTS of homemade Christmas ornaments. We also had a fabulous wood store near us that carried anything & everything wood, which I remember buying lots of fun things & painting them. Love her blog! Both of you have given me tons of ideas and projects to do with my daughter! I’m not sure if it’s the earliest I remember, but I always loved painting with apple or potato stamps. The earliest I can remember.. lets see, I think it would have to be in pre-k. I remember painting on black paper, I’m not sure with what but it made the paper appear cracked or frosted to look like snow flakes/ice. It was AWESOME! A faux stained glass Christmas ornament. We still put it on our tree. My mom had 6 kids…I was the oldest. I remember her encouraging us to color , paint and collect things from nature outside to make collages. One of my favorite things to do was to glue pearls ,sequins and beads to seashells from the beach. My grandparents took up oil painting in their retirement days and became quite good ! I always wanted to be an artist from a young age, just like them. I’d LOVE to win a book so that I could share the fun ideas with my 3 grandkids! Thanks for the great site and information! 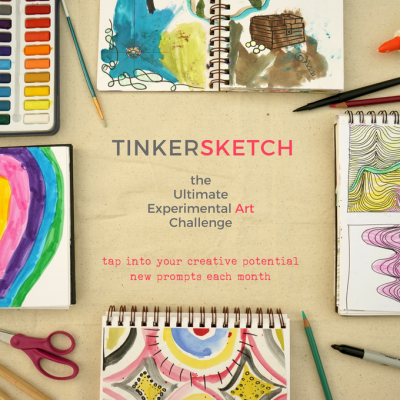 I’m going to have to check this out for my daughter–her art is brilliant! My mother chose a christmas tree ornament for us to make piles of every christmas, some to keep and many for gifts. I still have many of them around and it’s a fun memory. Each year was different – beads, embroidery, felt, weaving… I learned a wide variety of skills that way. i remember making “sandals” out of colored construction paper. i had all kinds of different designs and wore them around the house. I remember never knowing how to draw people and always being frustrated by that! i was just thinking this morning about the painted suncatchers I made as a kid. Your book looks great! I remember making a leprechaun out of a paper three-leaf clover when I was about 6 or 7. My mom still has it–all faded–on her dresser. The artful parent is my favorite book… I really love Jean’s approche… and off course I want to have a copy of the book! I have a 6 year old and two 4 year olds and I also feel the same way about always feeling like I cater to my older son and my two daughters are along for the ride…I am now trying to make an effort to provide my daughters with some basic exploratory art activities as I did for my son…I would love ta copy the of the book!! I got a sneak peek of this book too and can’t wait for it to come out. It’s amazing! We’ve tried the suncatchers and they are perfect for a 2 year-old and oh so pretty. My first art memory was fingerpainting in the mud. This will be a book I refer to time and time again. I can remember bubble painting in preschool out in the yard under a huge mulberry tree. 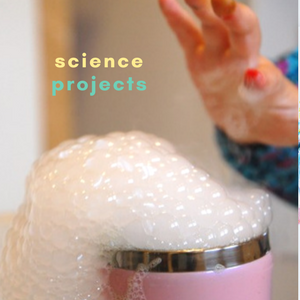 We’ve been following The Artful Parent blog for several years now and we’ve tried many of the projects she’s described. All of them have been fun. So inspiring! Thanks for a chance to win! I just remember drawing houses all the time. I loved making doodle lines and turning them into things, too. I love these crafts. I can’t wait to get this book whether in giveaway (which would be great) or purchased. My son is young now but the ideas are awesome and I know he will love it. I really like this sun catcher idea!! Neat! What a lovely book! I remember going over to our neighbor’s house and painting in her garden. I’d never water-colored before, or created art outside! So colorful and simple. For me childhood art project that comes to mind is blowing ink on paper with straw to create patterns. Thanks for the chance! A large painting of a hercules that won me a ride on a hercules when I was in Malaysia, which would have put me at < 5. I remember the painting and I remember Mum doing most of it but all of her encouragement and assertions that it was me who made it and the flow on always gave me plenty of confidence in my artistic ability. I remember making homemade books… when I was very little, my mom would write down what I said, and as I got older I could do the writing myself. Illustrating these stories was always the best part. Thanks for the giveaway! I’m not sure what my first work of art was, but I spent a lot of time drawing and writing stories as a child. I remember lots of time spent playing with papier mache and building things out of pipecleaners when I was young. My mother always made time for creative endeavors. I remember making musical insturments with rubber bands. I made a guitar from a kethup bottles and rubber bands. I also remember saving starburst candy wrappers to create picture collages. I remember glueing macaroni on 2 tinfoil boxes that were attached together to form a cross (yup, I was in Catholic school) We then spray painted it gold. It was probably the strangest piece ever but I just loved it! This book looks like it would be a wonderful addition to our art library! This looks like such an amazing, creative book. I am a huge fan of Jean’s site, and can’t wait to see her book. 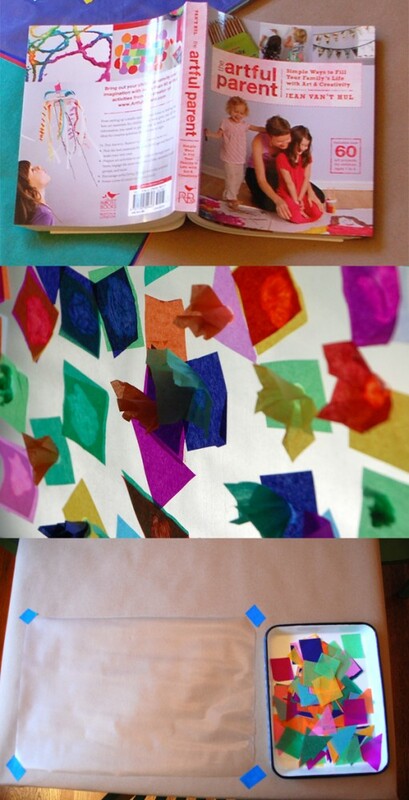 I took this contact paper project to our preschool, and it was so wonderful. I remember painting at an easel in preschool, and I also remember that practically every drawing that I ever made as a child had a smiling sun wedged up in the upper right corner of the paper. Can’t remember the earliest art project, but do know that I loved anything to do with art (and still do)! My children were all very creative and artistic, and my granddaughter has inherited that gene as well! She loves to paint! Would love to have all that creativity wrapped up in a book. i love her blog and i’m sure i will love the book! I would love to win a copy of this book – it looks amazing! My earliest memory of art projects would be learning how to cross-stitch from my mom. Great memories of learning a “grown-up” skill from her. LOVE that your daughter made this activity her own! Sometime in elementary school art class we did the classic move of crinkling up a large paper bag, laying it out, and cutting it to look like a fringed leather vest. I remember being so fascinated because I thought it looked so much like real leather 🙂 All I wanted to do was crinkle paper bags to make new leather products for weeks! What great ideas. My 3 year old son prefers more creative activities; coloring and drawing are not his thing. I am always looking for new ways to allow him to explore art and express himself creatively. This book looks wonderful! I’m so glad i discovered jean’s blog a few years ago. her book is gonna be great! I remember my dad helping my make a handprint in plaster for my mom for Valentine’s Day when I was 3 or 4! 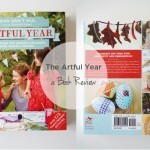 Love Jean’s blog and would LOVE to win her book! I remember trying to paint a picture of my favorite stuffed animal Elephant. I loved that painting. Thanks to both you and Jean for all your inspiration. It has to be my amazing (or so I thought!) macaroni collage that graced the kitchen wall until the macaroni started to drop off! I love her blog, too! My earliest art memory is making play food with play doh. 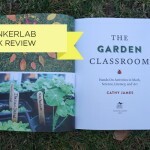 I love the blog and would surely love this book! Thanks for the chance to win, I love her blog! One of my earliest art project memories was making a pillow for my doll on my Mom’s sewing machine while she was at work. It didn’t work out as well as I thought it should. What a great review! 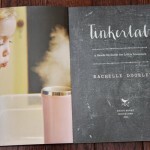 I’m really excited to get my hand son this book, and I’m loving the blog book tour idea. As far as the contact paper project goes- I’m sure my son wil decide to take in his own special direction… should be interesting, but fun! I remember crafting little animals made of chestnuts and toothpicks. I would love to book to do more art projects with my little son! What a fun book & blog. Looking forward to the blog tour! I would love to have so many ideas at my fingertips. Thanks for sharing one of the projects today! Not so much a memory of a product but I picture our art table with globs of glue and paint residue… I used to love making puppets with collage materials and pop sticks. Thank you so much for this opportunity-I’m trying to incorporate more art activities with my 14 month-old. One of my early memories from preschool is that my dad came with me once and we built an airplane in the “wood shop,” since he works at Boeing! I remember tie-dyeing a shirt. It was a sunny, hot late-spring day. Magical art class! I remember pinch pots! Making tons of them:). Thanks for the give away! I remember we did a waxed batik piece with crayons in elementary school. Would love to win a copy of this book. Something I would like my daughter and her friends to do during their playdates. I have fond memories of Mrs. Kruger, my elementary school art teacher… the first piece of art that I have detailed memories of my creative process is a really horrible painting of an eagle’s head. With a truly horrible blended color background that makes me cringe each time I see it in all it’s framed glory at my parents’ house (STILL!! )… But Mrs. Kruger really helped me through the entire problem solving process, especially when I had so much trouble trying to physically achieve what I saw in my head! Artful Parent is my favorite children’s art blog. We would CHERISH this book! My earliest memory is making turkey’s out of our handprints — for Thanksgiving — I think it was kindergarten. Not terribly creative — but I remember them being put up all around the classroom. I am a huge fan of The Artful Parent! Appreciate how user friendly and doable all the projects are. Would love to win a copy of Jean’s book! 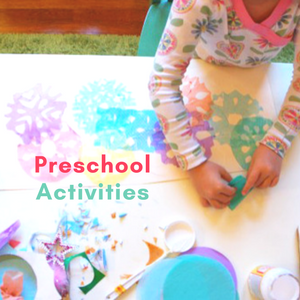 Earliest art memory….finger painting in preschool with awareness of the cold, slippery feel and smell of starch. I teach Pre-K through 5th grade ESL, and also 1st-5th GT so I’m always looking for ways to intersect art with literacy lessons. Thank you for this website and posts! The book seems a great helper specially with toddlers! Now, to the point: the first art activity I can recall is… since i went to Pre-K in Mexico, I remember making “papel picado” or cut paper. Of course very simple folds and cuts. I still remember how colorful the display came out to celebrate the beginning of spring of 19..77? 78? auuuuhhh time has gone quite fast!!! lol!! In addition, I wanted to congrats Laura on her diorama. I used to enjoy going to the circus my self, so I reckon she enjoyed making her diorama. Greeting from Sunny San Antonio, TX. Hello again… I just wanted to add that I’m thankful for the contact paper craft. I’ve seen the one that is made with crayon shavings iron in between paper layers but I thought that was more adequate for older kids. The contact paper art is safer to do with toddlers or for a school setting. Thank you again for the blog! and for sharing such age-appropriate art projects! What a great project and book! Earliest craft memory – water color painting at an easel in the kitchen. This book looks very appealing; I’d love a chance to win. Thanks! The Artful Parent sounds like a great resource for helping to foster creativity. THanks for the opportunity to win! 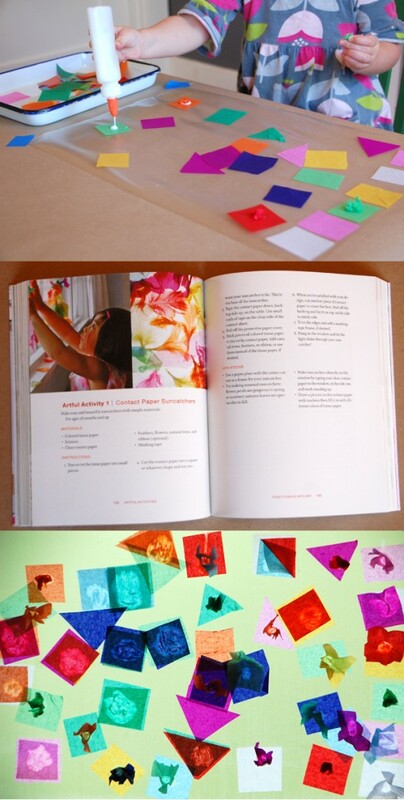 I know my girls would love trying out the activities in the book – we love The Artful Parent blog. As a child I didn’t get the opportunity to do many crafts at home as my mom wasn’t very interested in them… so I’m enthusiastic about offering many artful activities to my kids. The one that sticks out for me is a card I made for my Dad on his birthday …when i was 6 by spray painting a mix of colours with a toothbrush then folding the paper and opening it …it was gorgeous and he loved it since he used to paint …abstract and landscapes with oil on canvas !! 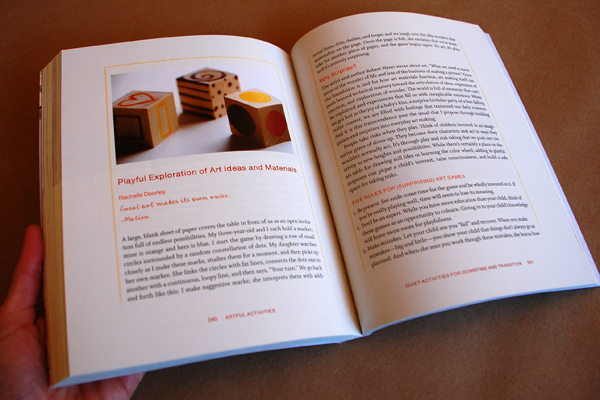 creative growth- You should check out our website and latest book The Missing Alphabet. We hope to see you there!